For a reality star, the comments section of their social media posts will likely include a mix of praises and downright cruelty. 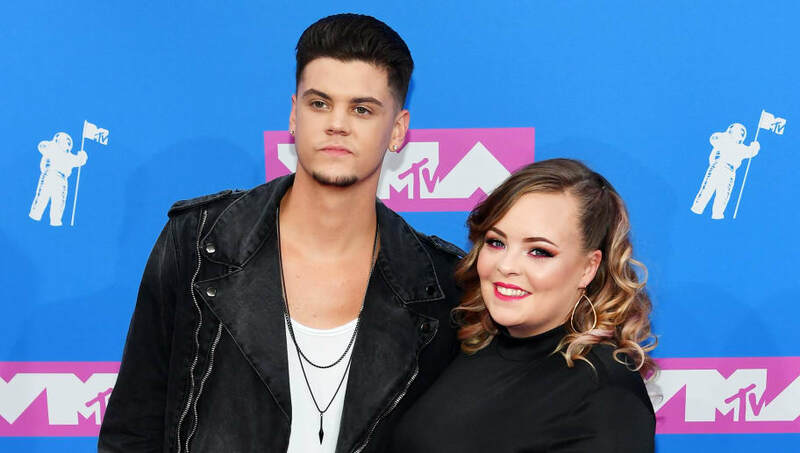 Tyler Baltierra recently posted a photo of his wife and Teen Mom co-star Catelynn Lowell on Instagram. "Was going to write something deep & meaningful but all I can think of is 'DAYYYUMM!' @catelynnmtv you look smokin babe! #Wifey," he captioned the photo of Cate, who just had the couple's third child two months ago. I was going to write something deep & meaningful ? ?‍♂️ but all I can think of is “DAYYYUMM!” @catelynnmtv you look smokin babe! #Wifey ???? However, the post was apparently met with a ton of negative comments about Catelynn. Tyler disabled comments on the post, but took time out on Saturday to call out the haters in a lengthy response. "After yesterday’s post, I can’t help but get emotional when writing this," Tyler began the caption of a new post. "The unnecessary mean & disturbing comments made about my beautiful wife, really just breaks my heart to be honest. It doesn’t make me angry...it literally just rips my heart to pieces." The reality star emphasized that the negative comments really hit home because of Cate's past difficulties with her mental health, which she completed a 40-day stint in rehab for last year. "After 11 years of this brave woman vulnerably showing her struggles & the most painful moments she will EVER experience in life, for the world to see, she does NOT DESERVE such cruelty!" Baltierra continued. "Do you not understand that a year ago, she was going to END HER LIFE!?" After yesterday’s post, I can’t help but get emotional when writing this. The unnecessary mean & disturbing comments made about my beautiful wife, really just breaks my heart to be honest. It doesn’t make me angry...it literally just rips my heart to pieces. After 11 years of this brave woman vulnerably showing her struggles & the most painful moments she will EVER experience in life, for the world to see, she does NOT DESERVE such cruelty! Do you not understand that a year ago, she was going to END HER LIFE!? Do you not understand that she grew up in a cycle of dysfunctional abuse, but yet STILL found the STRENGTH to fight the most primitive instinct a woman could ever feel & hand her FIRST BORN CHILD to another woman just to END that cycle!? Do you not understand that she suffers from a mental illness that requires her to fight vigorously EVERY DAY in order to keep it maintained!? All I know is what I understand about her...that she is the most courageous, loving, & beautiful human being I have ever met. And if you can’t see those things, then please just scroll on, there is NO NEED FOR HATE! So PLEASE, everyone pay attention...we just HAVE to be better at loving each other as co existing human beings. We HAVE to be better at lifting each other up & showing people the love that everyone deserves to feel. What I see here is a gorgeous woman, both inside & out, who I am lucky enough to call my wife! #SpreadTheLove #NoHate ??❤️✌? Luckily, unlike the other post, this one received thousands of beautiful comments, including one from Catelynn, who replied, "Omg thank you @tylerbaltierramtvI love you." Some believe replying back to trolls only gives them more power, but when people are attacking your spouse, you need to let them know that hate won't be tolerated. And we give Tyler credit for doing exactly that.